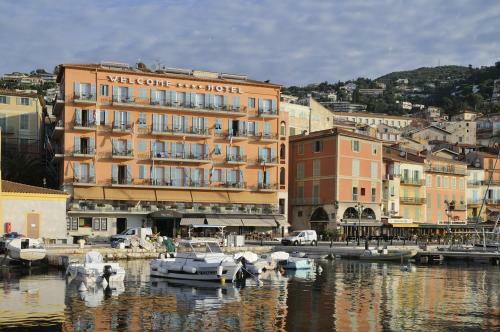 Nestled in the bay of Villefranche-sur-Mer on the French Riviera, the landmark Hotel Welcome is beautifully located in front of the port and the St. Peter Chapel. Its central location makes this 4 star hotel a great base for exploring the cobbled streets of the Old CityTown Villefranche, visit the Citadel, but also enjoy a day of sunbathing on the beaches, accessible on foot. This beautiful 4-star hotel on the seafront is also a smart choice for anyone wishing to see Monaco's Grand Prix, or take part to the Nice Jazz Festival yet away from rather mundane and anonymous places such as Nice and Monte Carlo. Completely refurbished, the Hotel Welcome offers 35 individually decorated guest rooms, ranging from double rooms to lavish suites. All boast spectacular seaviews over the Mediterranean and the quaint harbour of Villefranche-sur-Mer. To make your stay even more enjoyable, the Hotel Welcome now also features a brand new Wine Bar, the Wine Pier. This charming place with Provençal flair is the perfect venue to sip a cocktail or a glass of wine on the terrace while admiring the view.